oats | "blackberry-eating in late September"
I love a great many things about my job. Being a community college professor is rewarding in a number of ways, and my biggest fears: that it would be just an amplified version of high school, and that there would be limited opportunities to make lasting connections with students, have proved fairly unfounded. In fact, more students follow me from class to class and contact me semesters and even years after they have left our campus than anyone at the university level ever did. It’s gratifying. The thing I didn’t expect to miss, though, was a big library. Coming from a research university to a large community college, where the focus shifted from scholarship with teaching on the side to teaching with occasional, non-required research, was a big change for me, and it’s sometimes hard to access the materials I need. Yes, my library helps me get interlibrary loan materials, and I have a library card for UCLA’s massive collection, but sometimes things are missing. Sometimes things are checked out, or libraries say no. So I turn to other options: my research assistants. Funny enough, I probably have more unofficial, unpaid, unaware “RAs” than I would were I at a research university. And they aren’t RAs, really; they are just lovely people who sometimes help me access materials. Most recently, I branched out from my usual RA – my sister – and got some help from E., who sent me a few chapters of a book no one local could or would loan me. I’d found an electronic version of the parts I needed through Google’s book preview which, oh so helpfully, didn’t have any page numbers! How’s a responsible prof to cite her sources, if her sources won’t cooperate? So in thanks to E., who is revising his dissertation and clearly has much more important things to do than scan and send book chapters to his needy friend across the country, in spite of his loud insistence no such action was necessary, I decided to mail him a box of thank you cookies. I’d considered this combination a month or so previous: dried apricots and white chocolate in an oatmeal based dough sounded different and delicious, and my sister and I had talked about playing with its clear granola resonances and adding, say, flaked coconut, and maybe chopped, toasted nuts or seeds. For this version, though, I decided to keep it simple (though I did add guesses for quantities of coconut and nuts to the recipe, if you want to experiment). For the dough, I used an adaptation of my favorite oatmeal chocolate cookie recipe, one that Ghirardelli used to print on its semi-sweet chocolate chips bags, but has since changed to include both less butter and less flour. The products of that original recipe used to come with me, in great, craggy, unevenly shaped mounds, to field show competitions when I was in high school. After the first time or two, they never made it past the table at the entrance to the band room. But anyway, egregious quantities of barely soft butter (thought it does make a lot of cookies, so don’t despair), heaps of rolled oats, and a generous dosing of both white chocolate chips and meaty, moist dried apricots get mounded into tablespoon-sized heaps and baked until they are barely cooked through – they come out still quite soft and a little raw looking in the middle – and set up as they cool. The butter should be malleable but still cool from the fridge, never melted, and the dough should be stowed back in the fridge to keep the butter cool in between baking each batch; as with pie crust or biscuits, this keeps the cookies from flattening out as they cook. In high school I used margarine instead; if you do this they will stay puffy, but I prefer the flavor and make-up of butter. The oats should be of the old fashioned rolled variety, not quick cooking, for texture in the final cookie. When I sampled the first one, still quite hot from the oven, I thought it was good but a touch too sweet. But then I found myself eating another one, and then had to slap my own hand to prevent myself from downing a third in a row, so I figured I had to be on to something. Cooled, they lost a little of that initial saccharine hit, and considering that several dozen lasted all of two hours in my department mailroom when I brought them in last week, I’d say they were a reasonable success. Oh, and my primary reason for baking? I won’t embarrass him by revealing how many he told me he ate at one go, but I will say they had a good reception and I’m glad they are there to comfort him as he plows through his dissertation revision process. A little cookie comfort in the middle of that trying process, especially when that is happening as only part of the weirdness and horror of the world right now, is so necessary. Preheat the oven to 375F and line two cookie sheets with parchment paper. In a stand mixer with the paddle attachment or a large bowl with an electric mixer, beat the butter until it is broken down a bit. Add the sugars and cream on medium speed until very light in color and texture, 3-4 minutes, scraping down the sides of the bowl at least once to ensure even integration. When the mixture is pale and fluffy, add the egg and vanilla and mix at low speed until incorporated. At low speed, mix in the first ½ cup of flour with the salt, baking soda, cinnamon, and nutmeg. When it has incorporated a bit, add another ½ cup flour, mix to incorporate (don’t forget to scrape down the sides of the bowl), then the final ½ cup flour. This ensures you don’t get flour everywhere. If you are using an electric mixer, switch now to a sturdy spatula or wooden spoon and prepare to work out your upper arms. If you are in a stand mixer, continue at low speed. Stir in the oats until well incorporated, then the fruit and white chocolate chips just until mixed in. Scoop the dough in rounded tablespoons onto the prepared cookie sheets. I did 8 per sheet, to ensure no overcrowding. Bake in the preheated 375F oven for 9-10 minutes, storing the remaining dough in the refrigerator while each batch is in the oven. When they come out, the cookies will look underbaked in the centers. Take them out of the oven anyway, and let them sit on the cookie sheet for 3-4 minutes to set up, then remove to a rack to cool for at least another 2 minutes before scarfing. The cake world is populated by two camps, it seems to me: those which are definitively dessert, and those which are trying to be breakfast (I’m looking at you, coffeecake). Some of the “trying to be breakfast” denizens bridge the gap by taking the appellation “bread” rather than cake – banana and zucchini bread are the chief players in this particular masquerade. But they are, at heart, essentially still cake: sweet, plenty of fat from oil or butter, and sometimes interspersed with shards of chocolate for good measure. Carrot cake, the other popular vegetal option, doesn’t even pretend. It just comes right out there and, whether it’s for alliterative reasons or not, boldly declares itself a cake and leaves it at that. The idea of putting these long orange taproots into a sweet application came originally from the Middle Ages, when sugar was barely on the horizon and other sweeteners were hard to come by. Carrots as a cake ingredient have since had two spikes in popularity: once during the second world war, when sugar and honey were, again, in short supply, and once starting in the 1970s or so when it was touted not as a sugar-rationing option, but as a “healthy cake.” Really though, if we’re honest today’s carrot cake is far from healthy. It may have a discernible threading of carrots, and it’s frequently studded with nuts, raisins, sometimes even coconut or pineapple, but it is also loaded with oil for moisture and draped with that miracle that is cream cheese frosting. During a text conversation with my sister about golden raisins (probably 70% of our texts are about food), I developed a craving for carrot cake. This is an irritating paradox that happens quite often to me during the summer: now that I have plenty of time on my hands, I frequently get the urge to embark on elaborate baking projects. However, because it’s summer and school is not in session, I don’t have a whole department of people to foist my creations off on. I only have N. and me, and we would both like to retain our svelte (haha) figures. 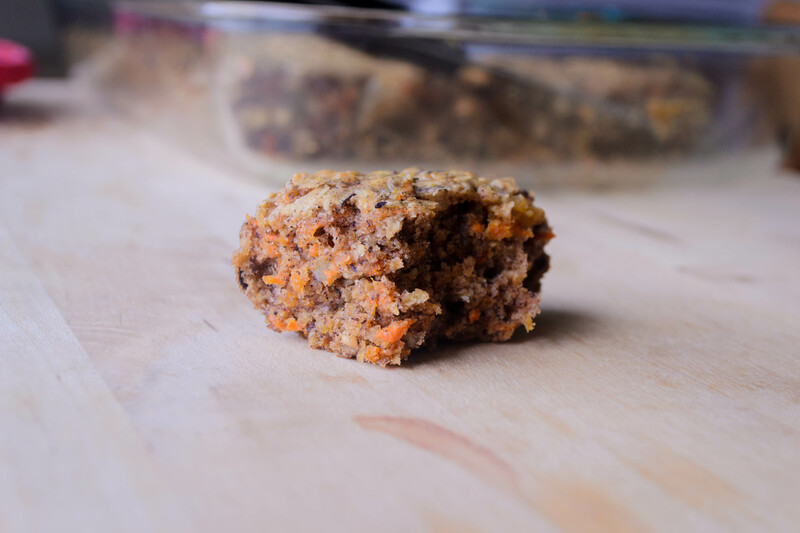 My sister suggested turning carrot cake into a muffin so it could be consumed for breakfast, and I thought even easier might be a tray of breakfast bars – moist and flat and portable and loaded with carrots and golden raisins. Thus I’ve taken carrot cake – the cake that isn’t even pretending to be anything but a dessert – into the breakfast cakes camp. What resulted is not your traditional super moist, super tender carrot cake drowning in sweetened cream cheese (not that there’s anything wrong with that, mind you). After deciding on a breakfast version, I wanted something that was not, in fact, cake. Even if we didn’t want it for breakfast, we should be able to turn to it as a mid morning snack without suffering an instant sugar high. It might be a good option for N. to slice into after running. It should be more filling – more substantial – than your typical carrot cake, and very lightly sweet. It should definitely include both nuts and raisins, the nuts should always be toasted, and the spices should be more assertive than in your typical cake. I added oats in place of some of the flour, taking a hint from one of my favorite granola/energy bar recipes and toasting them first. 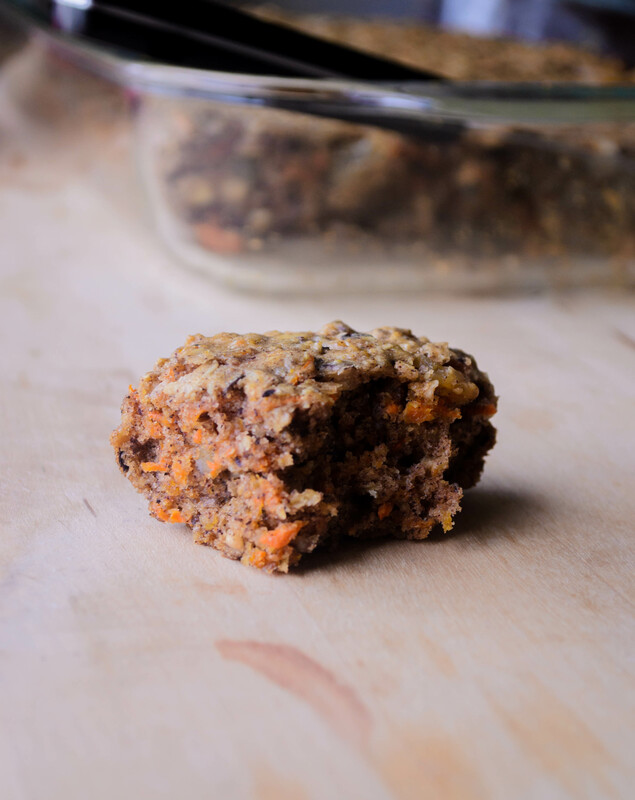 I cut down on the quantities of oil and sugar that most recipes call for, and ended up with something very lightly sweet – the carrots and raisins contribute most of the bursts of sweetness, not the mere ½ cup of brown sugar. If you’re looking for something sweeter, bump up the sugar by ¼ cup, as I note in the recipe below. The worst thing about making a carrot cake is grating the carrots. Working from the always brilliant suggestions in The New Best Recipe, I eliminated the frustration of grated knuckles and bright orange fingernails and used the food processor. This ends up being a considerable time-and-dishes-saver, because you can also use it to chop the nuts, pulse the oats, and, as the recipe testers in TNBR devise, emulsify the oil with the eggs and sugar to make a frothy, perfectly combined syrup of wet ingredients that integrate smoothly and quickly. 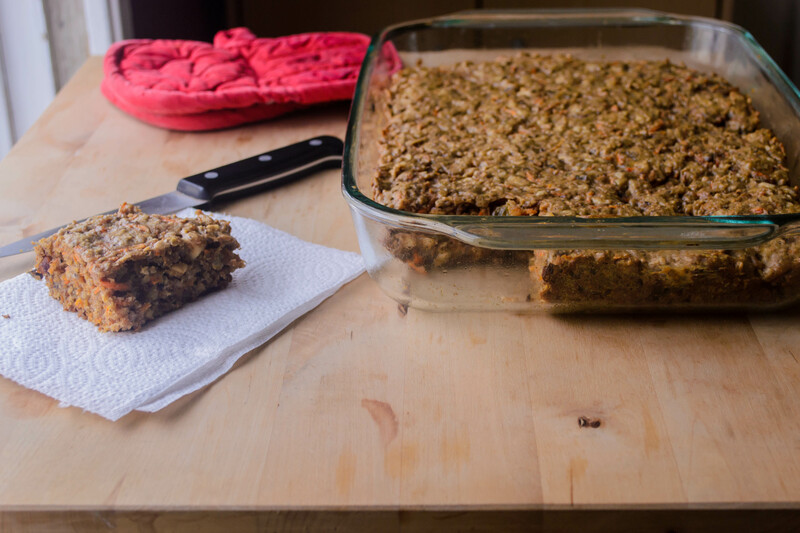 Toasting the nuts and the oats in the same 9×13 inch pan you’ll later bake the bars in means you’re only using, aside from various measuring and mixing utensils, a food processor, a single mixing bowl, and one baking dish. At first I considered making a simple cream cheese icing – just a breath of powdered sugar, and maybe some lemon juice to brighten it up – but found I didn’t want it after all. They were perfect, just as they were, and even better with a glass of iced chai. If you find you miss the frosting component, I’d suggest whisking a little honey or maple syrup into some room temperature cream cheese, maybe with a little lemon or lime zest if you’re feeling fancy, and adding a dab to the top of your bar. As well-spiced, fruit-laden desserts often do, these improve after a night of resting in the refrigerator, and are still just as good on the third or fourth day. This is perfect, really, because it means you can bake them the night before and have something all ready for an early breakfast before heading off on some summer adventure. Preheat the oven to 350F. 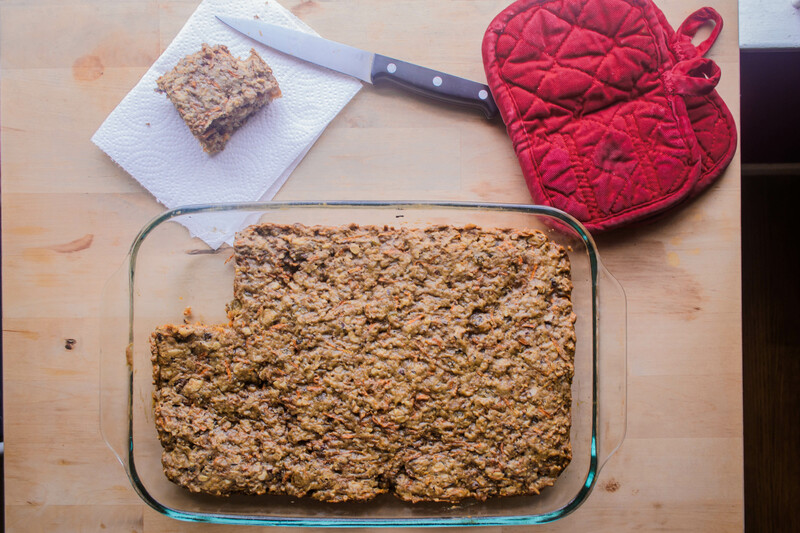 In a 9x13x2 inch pan, scatter the oats in as close to a single layer as possible. Toast in the oven at 350F for 15 minutes, until lightly golden and smelling strongly of oatmeal. Remove and pour into the belly of a food processor fitted with the metal blade. In the same pan, scatter the pecans and/or walnuts and toast in the oven at 350F. Depending on the size of the nuts, pecans will take 5-7 minutes and walnuts will take 5-10 minutes. They are ready just as you begin to smell them, even if they don’t look it – they will darken as they cool, and burned nuts are unsalvageable. When ready, remove from oven and set aside to cool slightly. 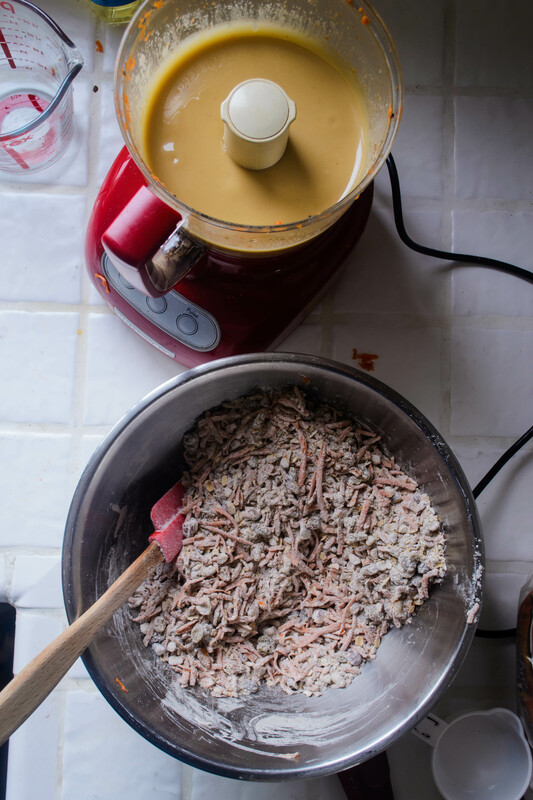 While oats and nuts cool, whisk together remaining dry ingredients in a large mixing bowl: the flour, the salt, the baking soda, and the four spices. 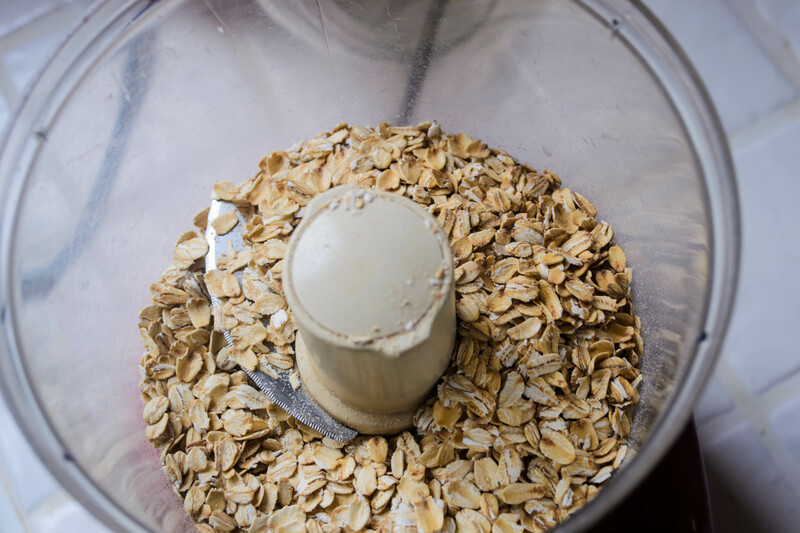 Using the metal blade attachment, pulse the oats in the food processor 3 or 4 times, until some are fine and powdery but some are almost fully intact. Add to dry ingredient mixture and whisk to combine. Add the toasted, cooled nuts to the food processor. Pulse 4 or 5 times until roughly chopped, then add to the dry ingredient mixture and again, whisk to combine. Now replace the metal blade attachment in the food processor with the shredding disc. 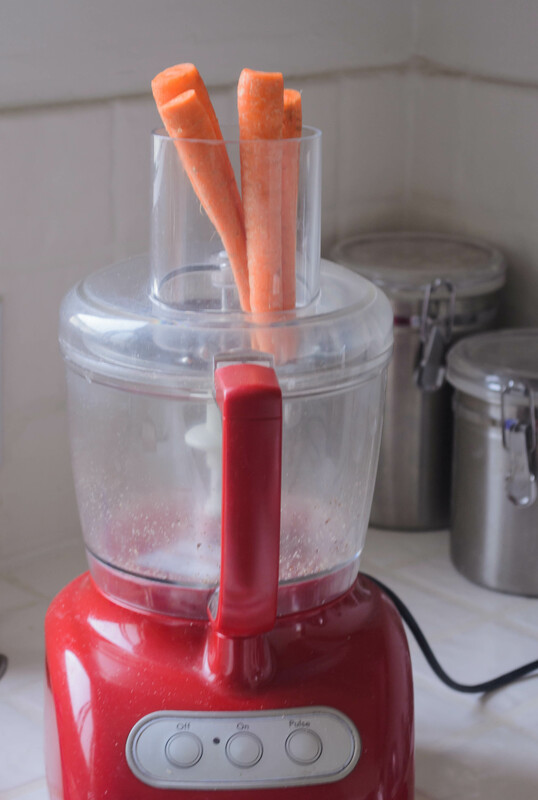 Feed the carrots through as close to vertical as possible for fine, thin shreds. You can peel the carrots before doing this if you want; I just scrubbed them off a bit. Transfer the finely shredded carrots to the bowl of dry ingredients. Add the golden raisins and fold them in with a rubber spatula. Switch the food processor back to the metal blade attachment. Process the brown sugar with the eggs and vanilla until the mixture is frothy – about 20 seconds. With the machine still running, add the vegetable oil in a steady stream and continue processing until it is emulsified – another 20 seconds or so. The mixture will be surprisingly thick, almost like a butterscotch sauce in texture and in color. Pour and scrape the emulsified oil mixture into the bowl of dry ingredients and carrots, and use a rubber spatula to fold them together until no hidden dry pockets remain. The resulting mixture will be thick, more like cookie dough than a standard cake batter. Lower the oven temperature to 325F and spray the same 9x13x2 inch pan you used for toasting with a non-stick spray. Scrape the batter into the pan and use your rubber spatula to flatten it into an even layer. Bake at 325F until a toothpick inserted in the center comes out with just a few moist crumbs; 25-30 minutes. 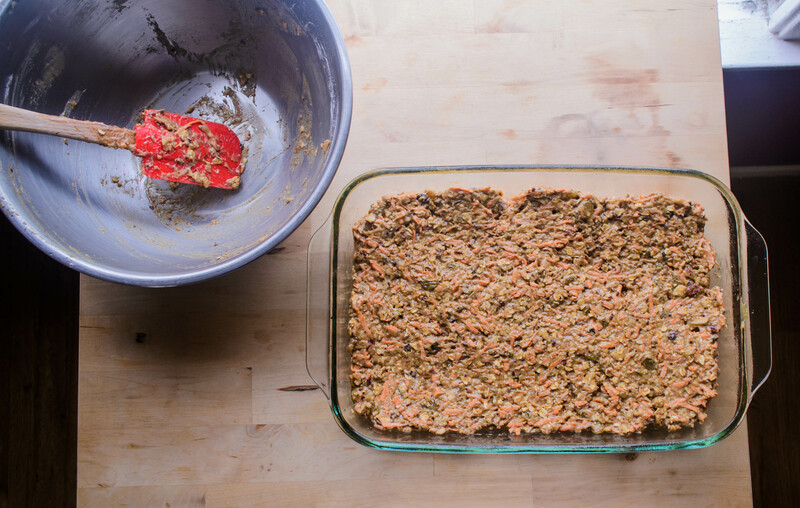 Let cool in the pan for at least 15 minutes before slicing into bars or squares.